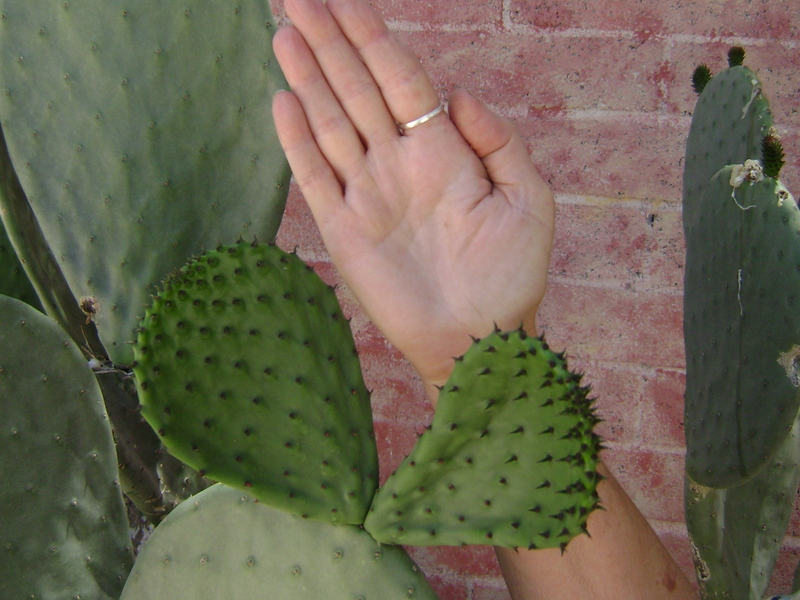 Pick new prickly pear pads in the spring when they are the size of your hand. Carolyn Niethammer with you this week. In our last post, Martha Burgess wrote about how early cholla buds were appearing this year. I have seen pads beginning to form on the native prickly pear, but not yet on my Ficus Indica, the tall Mexican variety. But they will be out soon, so let’s talk about how to prepare them for use in salads and casseroles. Scape off the stickers with a serrated steak knife. First thing is to don your rubber gloves. Even though these cactus pads don’t have large stickers, they do have the tiny glochids that can be awful to get out of your hands. Then using an old-fashioned steak knife with a serrated edge, go against the grain to scrape off the stickers. Keep a paper towel nearby to clean the knife and keep your working surface clean. There are an abundance of stickers on the edge of the pad, so just trim it off and discard it. At this point you can put the whole, cleaned nopal on the grill next to some chicken pieces or pork chops. Or you can chop the pad into smallish pieces. The Chicago restaurant owner, TV star and author Rick Bayless coats the pieces with oil, puts them on a cookie sheet and bakes until done. You can also do it in a frying pan. Cook until the color changes to a more olive hue. The slippery substance that is so healthy for your blood will dry up and become less noticeable. 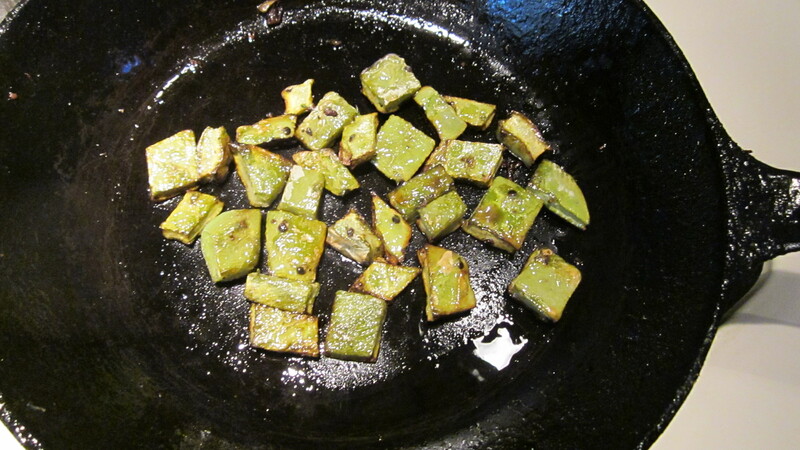 Cook nopalitos until they turn olive colred and loose some of their moisture. 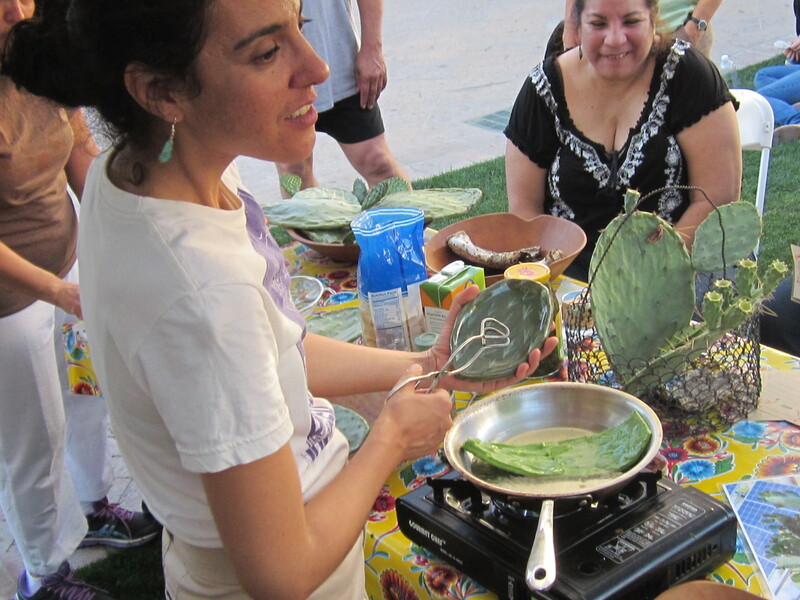 I watched my friend Amy Valdez Schwemm do a nopal cooking demo at the Mercado last year. Her method is a little different. After cleaning the nopal, she cooks it whole and cuts it up later. If you are cooking in a frying pan, this eliminates having to flip each piece individually. Amy cooks the pads whole then cuts later. At this point you can add to a salad (maybe picnic-style potato salad) or a casserole such as this one with lentils from my cookbook Cooking the Wild Southwest. Although prickly pear is a New World plant, it has spread over the globe. The Spaniards originally took it back to Europe from Mexico. I was fascinated to learn that it has colonized in Ethiopia in a big way. 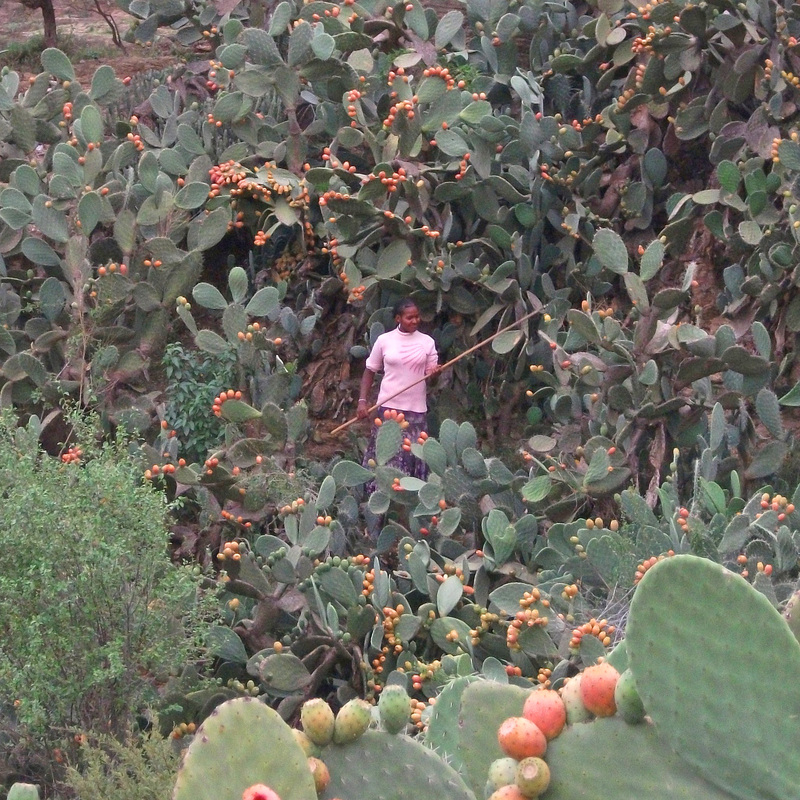 Some impoverished groups live on the prickly pear fruits for months when they are ripe. But people do not eat the pads there, although they feed them to their livestock. Here are some photos my friend Seyoum took showing prickly pear and his family in Irob, Ethiopia. A very large prickly pear plant in Irob, Ethiopia. 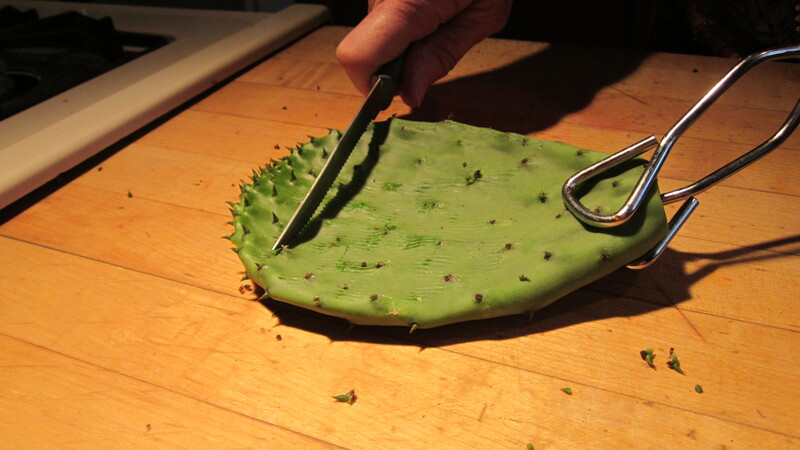 Preparing nopales for the livestock. All prickly pear pads are edible; it just depends on how much time you want to spend getting the stickers off. I usually wait until the Ficus Indica pads develop. Those with access to a Mexico grocery store can usually find them there, sometimes already cleaned. Once they are cleaned, they tend to deteriorate quickly, so buy just before you want to cook them. The very best tasting prickly pear pads I’ve ever eaten are grown on the foggy slopes of central California by John Dicus at Rivenrock Gardens. You can find him at http://www.rivenrock.com. He will go in the morning and pick you a boxful and it will be on your porch the next day. They are so fresh, they will last for many weeks in the refrigerator. He grows a variety he found in Maya country in Mexico and they are virtually spineless. And delicious! Excited to try prickly pear? 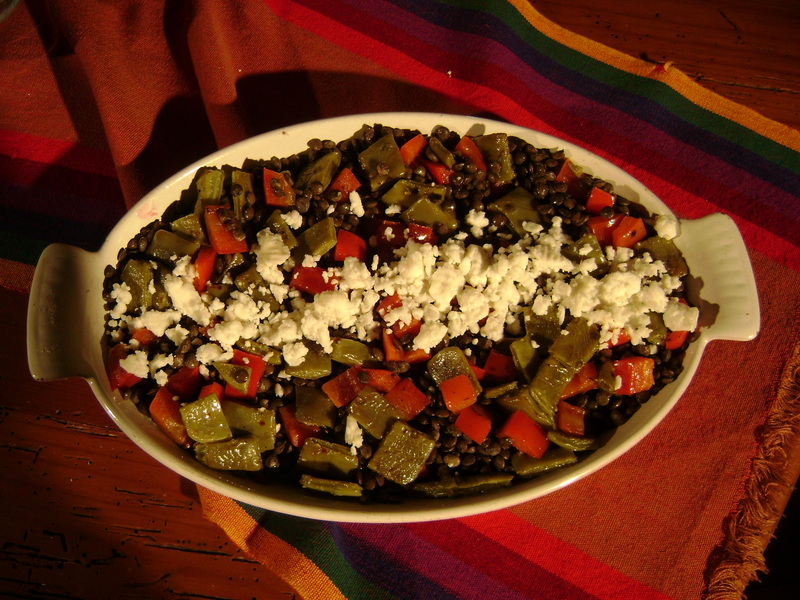 I give you lots of recipes in The Prickly Pear Cookbook and Cooking the Wild Southwest. Very helpful for controlling blood sugar and cholesterol.